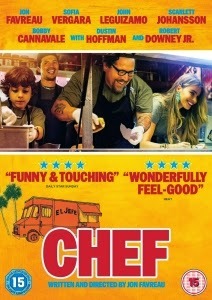 Jon Favreau returns from the creative wilderness following 2011’s tepid and workmanlike Cowboys & Aliens, cooking up something entirely different with latest offering Chef (2014). While unquestionably a slice of feel-good Hollywood wish fulfilment (complete with a credibility-straining fairy-tale ending), Favreau proves he can still do smaller and intimate, producing a fine-looking, immensely enjoyable concoction which harks back to the appealing and good-humoured indie offerings with which he first made his name. The director also takes the starring role as Carl Casper, the chef of an upmarket LA restaurant who has devoted more time to his culinary pursuits than to his family. Concentrating on creating new and vibrant dishes for the punters, he’s creatively hemmed in by his conservative boss (Dustin Hoffman). To make matters worse, the chef unwittingly gets into a twitter war-of-words with a famed food blogger who pulls apart the tired menu he’s been forced to work from. Quitting his job, the disillusioned Casper agrees to accompany his ten-year-old son and ex-wife (Modern Family’s Sofía Vergara) on a trip back to her home state of Miami. Reinvigorated after getting a taste of the local Cuban-influenced cuisine, he hits upon an idea to showcase his skills in a more mobile fashion, and manages to acquire an old, battered food truck. With his son and loyal sous chef (a wonderful John Leguizamo) in tow, the trio set about sourcing recipes via the various regions they traverse. Though Chef could never be accused of being a radical reinvention for Favreau, he certainly knows how to tickle his audience’s taste buds. The working relationships he’s forged in Hollywood means he has an embarrassment of A-list riches when it comes to the supporting cast, even snaffling his Tony Stark/Iron Man, Robert Downey Jr., for a cameo. Scarlett Johansson makes a small but memorable appearance, and Favreau himself is an endearing lead. Make no mistake, however – the food is the real star of the show. Casper’s gorgeously photographed prep scenes crackle with energy and excitement, and everything the character creates is imbued with a perfection and artistry, right down to a grilled cheese sandwich he throws together for his kid. A film of two halves, the narrative may be a little light on conflict or drama, but Favreau keeps things hugely engaging, with the father-son dynamic offering the requisite emotional beats. Light but flavoursome, Chef will leave you with a huge smile on your face and an even larger appetite.